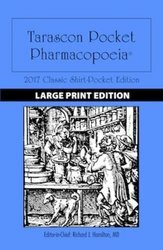 The Tarascon Pharmacopoeia® 2014 Deluxe Lab Coat Edition is an expanded version of the Classic Shirt-Pocket Edition, containing more drugs, black box warnings, evidence-based off-label indications for adults and pediatric patients, and additional tables. This reference also includes typical drug dosing (all FDA approved), available trade and generic formulations, metabolism, safety in pregnancy and lactation, relative drug pricing information, Canadian trade names, and an herbal & alternative therapies section. Multiple tables supplement the drug content, including opioid equivalency, emergency drug infusions, cardiac dysrhythmia protocols, pediatric drug dosing, and much more. Tarascon is committed to providing health care providers the best available portable medical references. Our acclaimed series of pocket guides succinctly distills and organizes hard-to-remember yet vitally important clinical information. Written by experts in their fields, readers repeatedly tell us that they are "must-have" books. 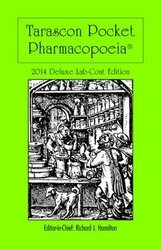 Click here to view all Tarascon Pharmacopoeia products.